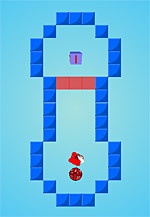 You go on the maze and collect diamonds. Time is only when you move. You need to open the hatch and move to another stage. To do this you need to reset in the hatch purple cylinders. 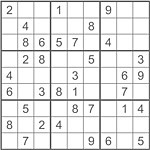 New to the puzzle - a moving puzzle. Here you need to collect video images, in which a person flies on deltaplane. Try to move the cubes so that they stand for three or more together. 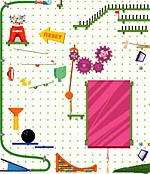 Put all the balls mixed as it is shown in the lower right corner. 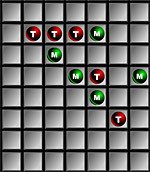 Mysterious matrix - a matrix of one, you get to the other if unravel the secret. To go a long way - it is necessary to anticipate all the obstacles. A girl with an odd ball situation - was the head instead of a ball and fly, but managed to cling to the roof. Help the girl to return the head. Superb puzzle in which you need to assemble a meal. Not quite the standard tag, it must be placed just as simple as 5 squares. The two closed rings are colored balls. Try to mix them, and then recover their position on the playing field. Destroy a number of facing pair figurines. You can also remove a zone of visibility, provided that the line connecting them would have no more than two bends. Funny game. Here you will reproduction. Several levels. Painted village. But something in this village is not the ... You have to find 5 of the drawings, which can not be in a medieval village. An interesting and very instructive game. Office of the mouse ..
All new - well forgotten old! We will never stop playing blind man's buff, tag, vybivnogo etc. Here's a toy notes nostalgic touches the soul. They warmly beautiful tic-tac-toe! A bit more modern, but they are! Russian soul was waiting for this game, like manna from heaven! 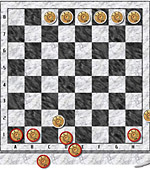 Finally a game that we learned earlier checkers and chess, now in flash!